Here’s my entry for the Modern Mini Quilt Challenge hosted by Jennifer of Ellison Lane. 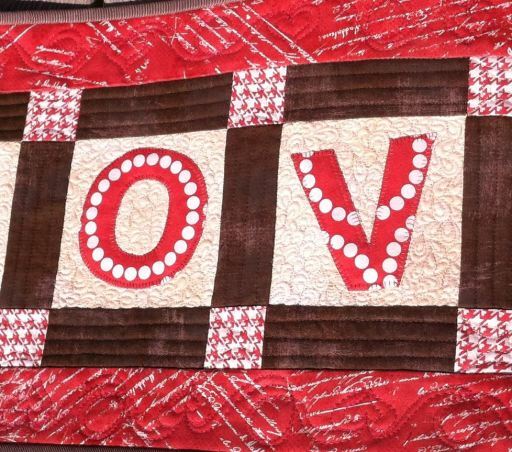 It’s called Love, a valentine’s table runner that I made back in February in my quest to add a little holiday decor to my home. I put together a tutorial for it (step 1, step 2, step 3) if you’d like to make a similar one for yourself! For this “mini” I challenged myself by working on improving my machine applique skills. 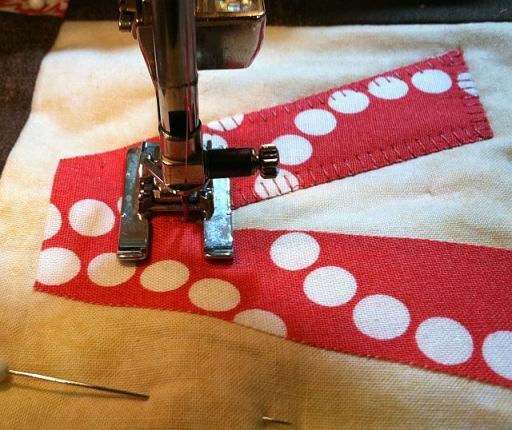 I think machine applique is one area of modern quilting that needs more exploring…. I used Pearl Bracelets in watermelon (my favorite color of the bunch) for the letters which was simply a computer font that I enlarged and ironed on using fusible web. I’m pleased with how it turned out and am now ready to tackle some larger projects! It’s such a happy mini! 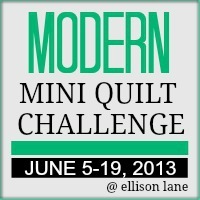 Thanks for entering the Modern Mini Challenge Christa! Beautiful! Minis are great for playing around and practicing something. Just found your site. I really like it! Will follow now. Lovely mini, and The O is fab – great choice of fabric. This is adorable! I agree with you, applique does need to be explored more. I definitely want to try my hand at it this summer. I think I’m most obsessed with that O and the full pearl bracelet. Adorable! Love the pearl bracelet letters. I love your wall hanging. It’s beautiful and you did a great job. My first quilt was a lot of appliqué. Imade a lot of mistakes but had enough fabric to make some pieces over. It is my fabric thing to do now. Thanks for sharing. Makes me want to make one right now. Oh yeah, I gotta go to work first. Beautiful! I adore your fussy cut feature fabric and background fabric as well. GREAT job and very inspiring, thank you! I love the way it turned out too and I agree…machine applique is something that I’ve tried a few times with just so so results. More info on how to do it well would be great. Minis are great to practice your fmq on!